0.625" holes spaced every 2"
The recently redesigned ES-1 remains one of the best-value squat stands in the industry. 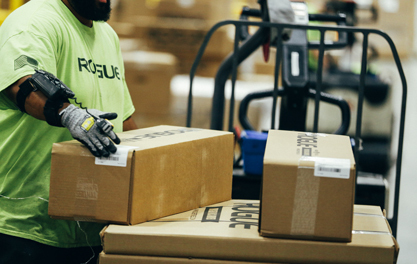 As Rogue’s most economically priced stand, the Echo model is a practical option for athletes on a budget, but it doesn’t cut any corners in the process. This unit is manufactured in Columbus, Ohio, right alongside our top professional-grade squat racks, and now features the same 2x3” 11-gauge steel uprights and protective UHMW J-Cups as the Infinity S-Series. Like the original Echo Stand, Version 2.0 skips the unnecessary bells and whistles to focus on function, space-efficiency, and dependability—handling your 500 LB back squats with ease. 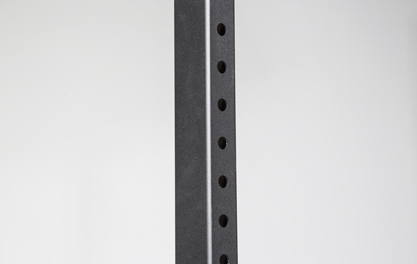 The 70” uprights have ⅝” holes spaced 2” on center on the front and back, and the base components and crossmember are constructed from 2x2” 11-gauge steel, with ½” hardware included. Athletes on a tighter budget shouldn’t have to settle for an inferior, unreliable import rack. The Echo Series offers the bare essentials required of a 70” squat stand with the higher grade of USA manufacturing + easy set-up, a set of Infinity J-Cups, and new plastic base covers to protect your flooring. The entire 11-gauge steel unit is finished in a quality black powdercoat. Version 2.0 of the Echo Squat Stand introduces expanded 2x3” 11-gauge steel uprights—the same tubing used in our Infinity Series racks—with ⅝” holes spaced 2” on center. We’ve also added Infinity-style J-Cups with UHMW plastic covers to protect your bar. The entire ES-1 is manufactured in Columbus, OH, and features a 2x2” 11-gauge steel base section with ½” hardware and a set of plastic feet. Once set up, the unit occupies just a 48” x 47” footprint. Footprint 48" x 48" 48.5" x 48"
Rogue Echo Squat Stand 2.0 is rated 4.8 out of 5 by 38. Rated 4 out of 5 by Army165 from Great stand for the money! I bought this right before xmas. Really wanted a power rack but height constraints in the garage prevented that. Fit and finish is flawless. Everything went together without issue and the powdercoating is even. Welds are much better than I assumed they would be. Only thing I wish they would include is the Westside hole spacing on the uprights. The difference between the S-1 and this stand is 2 inches in height and hole spacing, especially since they've add the plastic lined J-cups and 2x3 inch posts. Its not terrible, just makes it more difficult to get the right position when benching. Other than that minor complaint, its a great stand. Does its job well, holds any weight I throw at it while being completely stable at the same time. Rated 5 out of 5 by CoDaff from Great Buy I bought this a month or so ago expecting that it would get the job done, but as soon as I assembled it I felt like I had made the right decision. Much sturdier than expected, and extremely convenient. Does move fairly easily when walking weight back into it but easily accommodated for with any form of "stop" on the floor, I just nailed two pieces of 2x4 to my platform and it won't go anywhere. Great purchase, zero regrets. Rated 5 out of 5 by Boyer3 from What more do ya need?! I am in the process of putting together my home gym and purchased this rack and so happy I did! It is very strong, does not budge when I rack my Ohio bar! 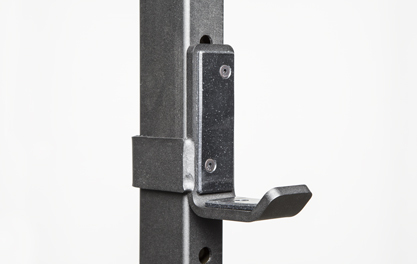 perfect height for smaller areas, very strong, takes 10 minutes to assemble, great quality! very satisfied customer!!! Rated 5 out of 5 by yarabodi from Best bang for your buck! Although this might be Rogue’s most affordable rack, this thing performs quite well. Takes about fifteen min to assemble with one person. Do yourself a favor and number the holes with a chalk marker. Makes life so much easier. Rated 4 out of 5 by holbythebear from Easily movable and will hold the weight I had a R-3 bolted to my garage floor, but after purchasing a van, needed to sell that and get something I could move around the garage easier. You can move this squat stand very easily, almost too easy. It will slide a little if you rack your weight too hard so I have to be mindful of not slamming the barbell into the j-cups. The little plastic pieces on the feet are great for sliding your rack around and protecting your floor. If you back it into a wall, or put 45lb pounds on the feet, it will not slide. One thing that was a little upsetting is that one of the uprights had a dime size ding in it, which was painted over. The R-3 that I had was much bigger, but the rack came with no imperfections. Not a huge deal as I'm sure this won't be the last mark on it. I'm confident this thing will hold whatever weight you put on it, but be aware the the gussets (holding the uprights) are pretty thin so side to side there isn't much stability. I took a silver sharpie and numbered the holes and it actually looks pretty good. I believe if you are looking at this stand, the main reason to purchase would be because of the 3 ships free shipping. If you can drive to Columbus to pick it up, or if you order one of the packages that includes free shipping, I would move up to the S-1 or the SML-1 because the price difference compared to how long you'll have it. Both of those have heavier bases (2x2 on echo vs 2x3 on S-1/SML-1) and heavier gussets with bigger bolts. Rated 5 out of 5 by Garage_Workout from Superb quality, great stand! I've had the Echo Squat Stand for two months now and it's great. Combining this stand with the bench allows for a lot of different exercises. I also have an additional J-Cup set so I can easily transition from bench to squats. The build is really solid. And the customer service at Rogue is equally impressive. Rated 5 out of 5 by Tonymack from Great Squat Stand! I bought the Echo Squat Stand five months ago for my first step toward building a garage gym. This rack is sturdy (but note the weight capacity) and I use it for squats, presses, rack pulls, and power shrugs. For the price, this squat stand is of high value due to the versatility, load capacity, and lightweight simplicity. In the next year, I plan on buying another separate Rogue rack and using both to do supersets. Highly recommend this product for 500 lb loads and below! Rated 4 out of 5 by Jaimo from Really built well Wanted some equipment at home to compliment my training program at box. This rack is terrific. Sturdy enough to put good weight on and light/small enuff for a home gym. With Rogue flat bench, can do all workouts.